Synopsis: A television network exploits a deranged former anchor’s ravings and revelations about the news media for its own profit. Did You Know? Peter Finch became the first winner of a posthumous acting Oscar for this film. Quotables: HOWARD: I’m mad as hell, and I’m not gonna take this anymore! Network is a shooting star of brilliance. It’s media telling its audience not to listen to the media. 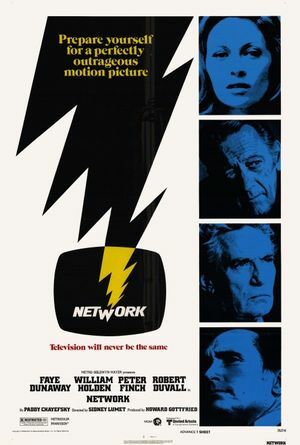 Faye Dunaway is the greedy producer, Peter Finch is the cynical and evangelical news anchor, and we are the bleating sheep, blindly following both of them. We are all stalwart servants to social media and television. Then a prophet comes along to denounce the stranglehold that it all has on us, and we loudly express our outrage for having been duped. But in the end, we’re accept it, because otherwise we have to deal with life.